1,2,3...EasyPC: Hoot of a Card!!! Before I share today's card with you I have to send out a MASSIVE thank you to Katie Ridden for the inspiration. Since birth of bubba #2....most of her creative works are shared on Facebook here. We met a couple of years back on a creative forum...and our daft senses of humour were a PERFECT match. Now for those not all knowing in the "real young-uns" area....the above are punch art creations of Hootabelle and Hoot the Owl. Hoot has his own programme on the ABC here in Australia (Giggle and Hoot). I tried to get the drawers as close to authentic as possible using EF's and some checkered DSP with a slight marker adjustment to make the squares bigger. I stamped the Weathered BGS in Versamark to add a bit of texture to all the brown space. Under the "Happy Birthday" there is the "splat" from Extreme Elements in very light pink. (sorry about the dodgy pic). The card is known as a Side Step card. There are many tutorials around, but I used this one here by Jackie Topa. When I gave it to the doctor in question, I was MOST stunned and shocked by his reaction. I am not really THAT tech savvy (he is about a decade younger than myself and STREAKS ahead!) He snapped a pic on his iPhone, sent it to his fiancee, she sent a text back and he came in whilst I was with a patient with HER reaction!! Thankfully the patient was a regular and has a brilliant sense of humour. Now I have used a lot of stamp sets and punches here. I will try to list them all, but if you have any questions, please ask and I will get back to you. Thanks for popping by and making to the end of this post. super cute, I love this to bits, and I am a little fan of hoot, Harry and I still say "see you in the morning hoot hoot" every night lol. Great job. This is simply gorgeous. Love it. You have been busy lately Lynda. Great to catch up on all your creativeness. 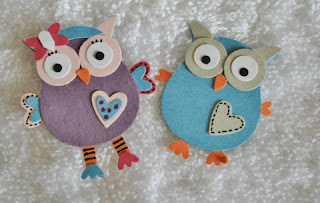 Love these little 'Hoot' owls. You have done an awesome job. Gorgeous Lynda and glad I could be inspiration for you, you always have lots of inspiration for me.